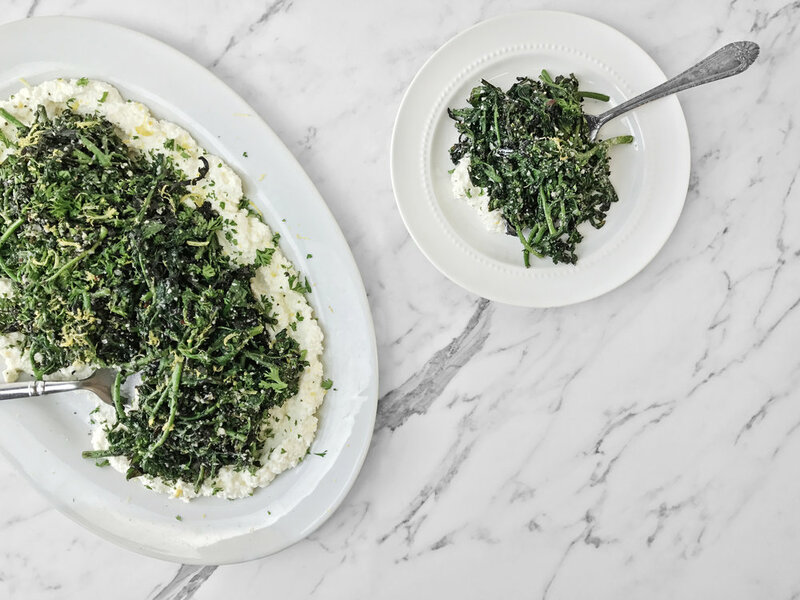 Just like the more familiar Broccoli Rabe, or rapini, the word rabe for both of these two produce items signifies mature, heartier leaves more unruly than standard Arugula or Mustard Greens. They're both super easy to work with-just requiring a quick rinse and dry before using. The quality of both is excellent right now and neither require much trimming or sorting. These items are only available while in season, to see what’s currently in stock, check here. The serrated green leaves grow from woody, sometimes purple tinged stems and are often sprouting spiky green buds, resembling broccoli rabe. Arugula rabe has a deep vegetal flavor with peppery and bitter notes. It has stems that are a little tougher, but cook through easily on the grill. They could also be roasted or braised until very tender. The purple tint would pop in a raw preparation. Here, our chefs have prepared it grilled with olive oil, salt and pepper, tossed with grated Romano, plated over a smear of hand-dipped ricotta, and finished with Tuscan olive oil, crunchy salt, and lemon zest. The mustard rabe is a little more peppery, almost spicy. The blossoming flowers are bright, aromatic and offered an intensely peppery bite. The flowers would make a really interesting pickle. One pound fills a full sheet pan for quick mise en place and fewer dirty dishes. Our chefs hot roasted the mustard rabe until crispy with olive oil and chili flakes, tossed with scallion and red chili, and seasoned with ponzu and toasted sesame oil.